Some materials can’t survive a flood or other water-related disaster. But many materials can; as long as the drying process takes place quickly and thoroughly. That’s why you’ll want to call Pro Restoration, Inc. right way if you have a water disaster. Absorbent organic materials like wood, paper-faced drywall, leather and natural fibers (cotton & wool) present the greatest opportunities for a mold infestation. But our specialized, heavy-duty drying and dehumidification equipment can quickly remove moisture from materials and air. This drying action discourages mold growth and removes the growing medium for water-borne bacteria. 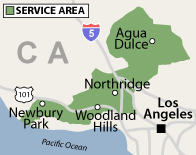 We are the experts in Sherman Oaks, Canoga Park, Van Nuys, Woodland Hills, Westlake Village, and nearby. Act fast to remove moisture from water-damaged walls, floors & ceiling. After standing water has been removed, the next step is to remove moisture. Dehumidifiers can help dry your property faster and can be especially useful when outside humidity levels are high. To make sure your structure and the materials inside are completely dry and to help keep mold and mildew away, contact Pro Restoration, Inc. to begin the water removal and drying process as soon as possible. Here at Pro Restoration, Inc., we offer dehumidifying services where you need them. Whether you have recently experienced a flooded basement or a mess in your bathroom or kitchen thanks to a clogged sink, we can remove all moisture and prevent mold damage that can cause an even bigger headache. When your property has a water-related disaster, why endure the anxiety of calling numerous contractors to undertake different parts of the water damage restoration process? When you contact Pro Restoration, Inc. for help, one call does it all. We have the tools and training to handle your recovery process from start to finish. What’s more, our experts can get to your site right away to meet with you and your insurance agent. Contact us at 1-855-512-6813 or get an online quote for fast, effective dehumidification in Woodland Hills, Westlake Village, Sherman Oaks, Canoga Park, Van Nuys, Newbury Park, Pacoima, Granada Hills, Northridge, North Hills, Encino, Calabasas, and many parts of California.